“Churches in The Modern World” opens this Wednesday in Gallery 2 of the Lighthouse, Glasgow. Collective Architecture were commissioned to design the exhibition, which will travel around churches in the UK, by the glasgow School of Art. The exhibition also opens at Liverpool Metropolitan cathedral on 6th September. For more information on the venues please visit www.gsachurchproject.wordpress.com . Photos will appear on our website and tumblr soon! 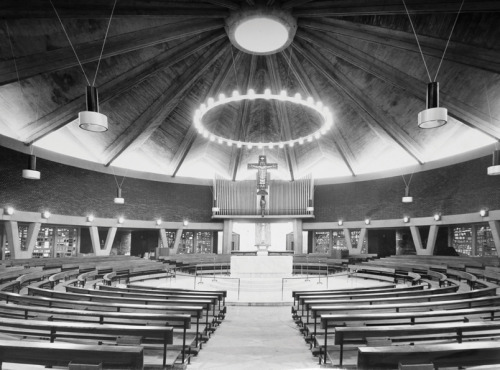 “The exhibition ‘Churches in the Modern World’ explores the period of extraordinary change in church architecture over the two decades either side of the Second Vatican Council. Nine key buildings are illustrated in depth using new and original photographs, archive documents and significant texts from the period. The subject of post-war Roman Catholic church architecture is articulated through three themes: Tradition and Modernity; Devotion and Liturgy; Church and City. The exhibition is one aspect of a major research project by Robert Proctor, Lecturer in History of Architecture at the Glasgow School of Art, funded by the Arts and Humanities Research Council, with Ambrose Gillick as Research Assistant on the project. Other work includes articles and talks and a book, due out in 2014.